Terry McCain (Griffith) is a Chicago cop who is pretty much on the edge. A member of the Tactical Narcotics Unit, he’s obsessed with taking down the slick mobster drug dealer Sal DiMarco, who, like John Gotti, seems to be made of “Teflon” and always manages to avoid jail time. During a shootout with the DiMarco mob, three million dollars in a suitcase goes missing. Naturally, DiMarco wants it back, and he assumes McCain and his team are behind the missing loot. So now the mobsters are after the cops, and McCain and his girlfriend (Lewis) must go on the run. Luckily Police Chief Devlin (Henriksen) has given McCain a wide berth to go off on his own (not necessarily “rogue”) and catch/punch/kick/kill the baddies. After some mild twists and turns in the plot, we see who is the true dispenser of EXCESSIVE FORCE. The good news is, this is a movie that lives up to its title. There’s some hilariously, unnecessarily brutal violence, as if the writer (T.I.G. himself, interestingly enough) felt he HAD to live up to the title. Like he thought, “well, I already spent all day coming up with this title, better make sure the movie has an excessive amount of force”. Well played, Mr. Ian Griffith. Well played. The real reason to watch this movie isn't Thomas Ian Griffith's constant roundhouse and jump kicks, but the killer cast! For starters, what is James Earl Jones doing here? This might make an action movie first: a Shakespearean actor on hand to play Jazz with Thomas Ian Griffith! Terry McCain is a pretty in-the-pocket Jazz pianist, just so you know. (McCain also has an earring, so you know he’s cool, long, greasy hair , resembles Christian TV evangelist Joel Osteen and might be a member of the Trenchcoat Mafia. Research is still being done). Then we have Lance Henriksen, doing his best as Devlin, Tony Todd as Frankie, again, struggling against some potential mediocrity and coming out quite well, the awesome Burt Young doing what he does best - being Burt Young. The movie could have used more Burt. The presence of Charlotte Lewis as the model Anna Gilmour was appreciated. And of course all the lesser-known names in the cast performed admirably as well. Additionally, the Martial Arts Technical Advisor on the film was Benny “The Jet” Urquidez. Sadly he doesn’t appear on screen. So you have a much better than average cast for this sort of thing, which is nice, and they help to sell the more inane aspects of the plot without you even realizing it, because that’s what good actors do. And, yes, this movie is riddled with cliches, but for the most part they are the FUN cliches you want (You mean Terry McCain‘s use of excessive force is always getting him in trouble? No way!). Amazingly enough, this movie went to the theater! It never would today. Maybe the cast is part of the reason why. But the movie is enjoyable, if not groundbreaking, and, yes, much of the brutality is fairly unwarranted, but this is EXCESSIVE FORCE people! While not nearly as violent as, say, Wardogs (1986), perhaps Griffith felt he went too far and didn’t want to be pigeonholed, so the follow-up, Ulterior Motives (1993), is less impactful. ‘Motives does not consistently and strongly follow up Excessive Force properly and a lot of steam was taken out of the T.I.G. train. That might explain why he isn’t really a household name, even among action movie fans. For a fun beat/shoot ‘em up, try Excessive Force. I haven't watched much from T.I.G. but it's odd that you covered this because I watched the trailer over the weekend while searching for films to add to the queue. One of the most important (but underrated) elements of the action b-movie is the quality of the supporting cast and it seems like it's a huge boon here. Good review, I'll have to track this one down. It is definitely worth watching for the supporting cast. Lance Henriksen was great in this. Would be interested in your opinion. This is just part 1 of T.I.G. week! Thanks! T.I.G. could have been in the ranks of Seagal and Van Damme. This was definitely one of his best films. It's funny you mention Ulterior Motives and Crackerjack. Those are the other movies during T.I.G. week. We didn't really like UM, but we somewhat enjoyed Crackerjack for the silliness factor. Speaking of excessive violence, what's your take on that last Rambo instalment? Thought it was pretty fun! Stallone at his best. Yeah, this was a kickass film as is Crackerjack. Another Griffith film you should check out is Behind Enemy Lines. BTW Ulterior Motives was actually made before this film. Definitely agree. Excessive Force was a lot of fun. Saw Behind Enemy Lines on TV, will look for the uncut tape. Didn't know Ulterior Motives was made first. Thanks for the info! Oh heck yeah I remember this one. I think this is the first thing I saw T.I.G. in after Karate Kid III. While I didn't like that film, I thought he had a fantastic presence in it and wanted to see more of him. Definitely agree with you. When he has the right material, Thomas Ian Griffith can be pretty entertaining. 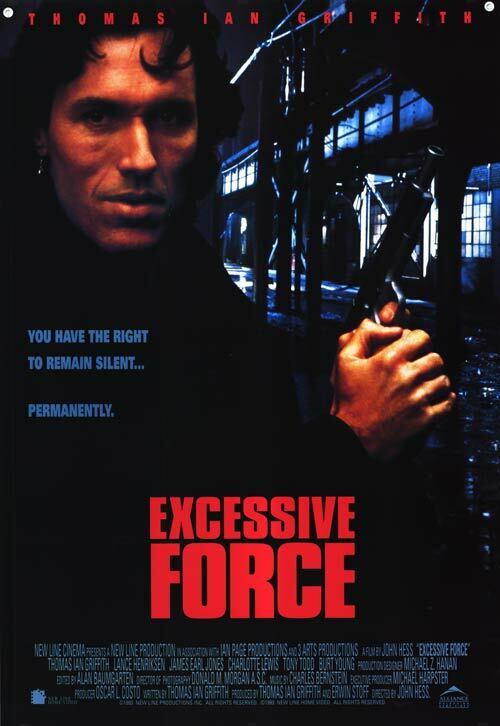 Excessive Force is one of his better movies. Hard Ticket to Hawaii - ever heard of/seen it? Looks like a good place to start if I want to add some more TIG to the DTVC. Michael Van Zandt: We have heard of it but never seen it. DTVC: It definitely is a good place to start for T.I.G. There are a lot of fun moments. Watched this a while back - not bad, not great either. I think Griffith watched too much Hard Boiled with the whole cop on the edge relaxes by playing some jazz (in this case piano). Anyone know if the in-name-only sequel Excessive Force II: Force on Force is any good? Definitely agree about the Hard Boiled comparisons. The movie was fun, but a little mediocre. 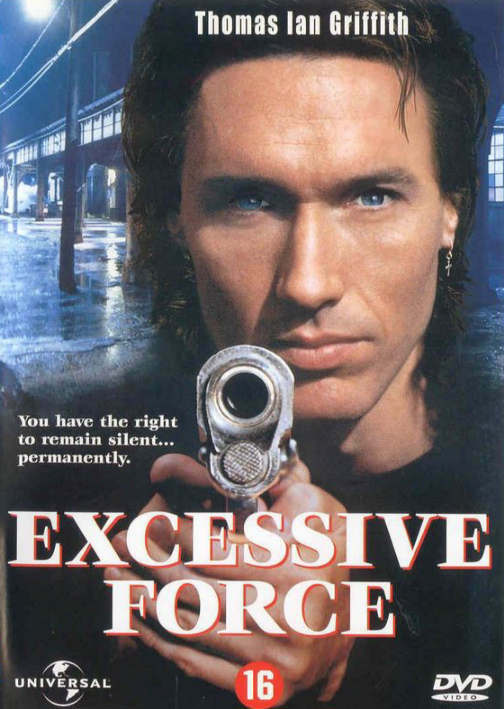 Saw Excessive Force II: Force On Force a long time ago. It wasn't bad. Will have to re-watch that some day. I've got to chime in on the TIG love. His performance as Terry Silver in Karate Kid 3 is one of my all-time faves. You've got to love any guy who tells his secretary, "Hold all my calls, for the next week my business is strictly revenge!" TIG is great in just about everything he does. Thanks for your comment! 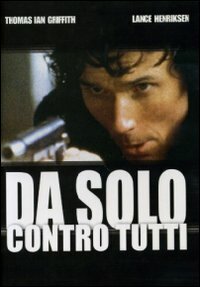 I really enjoyed this, I have seen that in the cinema back then. Haven`t seen it in some time, maybe I should give it a run in my player soon. That is really cool that you saw this in the theater! Would be interested in your take on it. This looks more like a product of 1988 than 1993 in terms of atmosphere and feel. Regardless this is a true classic and I'm ashamed it took me this long to see it. 1993 was a great year, with fare like this, Extreme Justice and Martial Outlaw, but this might take the cake. I watched this in disbelief, the way one might watch Deadly Prey or American Commandos. The level of violence and the harsh language had me shaking my head in amazement and satisfaction. The familiar Chicago location gave it a feel of Code of Silence or Above the Law and the whole thing is hard hitting, brutal and uncompromising, or whatever stale adjective you can throw at it. I really can't get enough of this stuff. I could overdose on it. Thank god for You Tube so I can do that. Happy you finally got to see it. Excessive Force rocks. So much fun and brutal action. TIG at his best. More good analogies in the comments, guys. A quite rare mainstream B flick. Also rare to see Lance and Todd facing off. Thanks. Happy you enjoyed the review, Jeff! This is classic TIG.